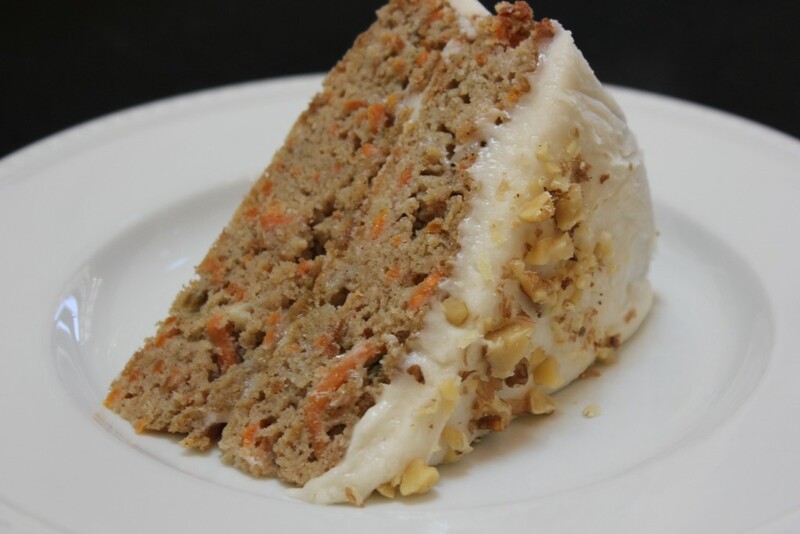 Food and Wine did well with this recipe: Coconut Flour Carrot Cake. I made this cake at Easter to provide a satisfying dessert that would work for adults and kids with gluten and dairy restrictions. It’s hard to tell a kid they can’t have the usual Easter chocolate, cupcakes, etc. without offering an enticing alternative. This was a hit, even with the little ones. I let my little guy lick the frosting bowl, so that did help get him interested. The cake is moist and dense, a little more dense than regular carrot cake. But the flavor is right on. 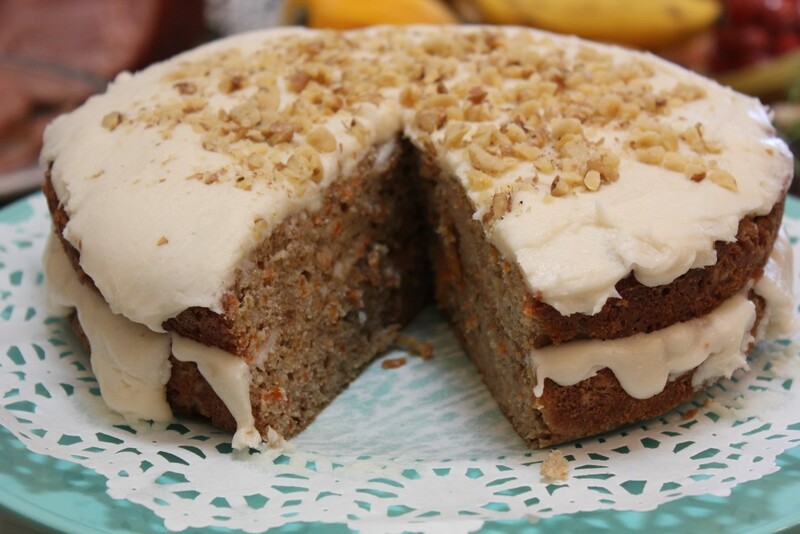 There is a hint of coconut from the large amount of coconut oil used in the recipe and a little in the frosting. 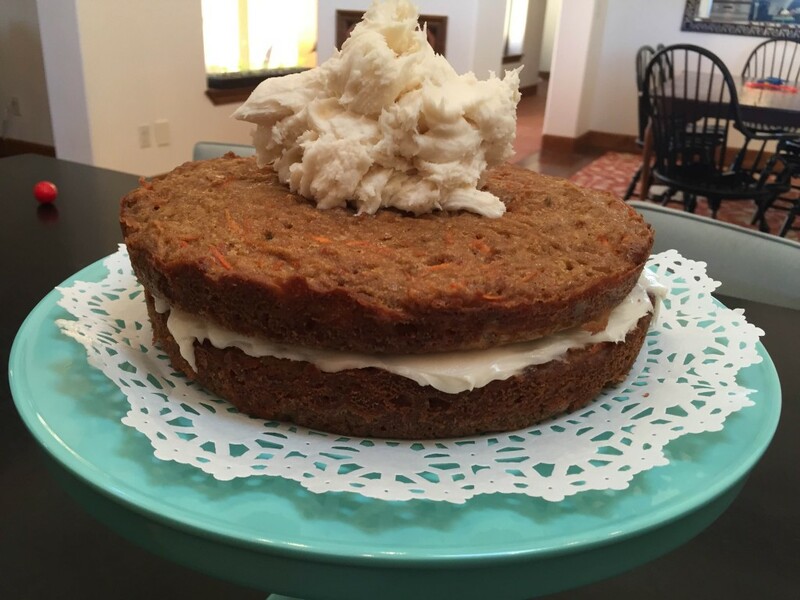 The frosting uses just soft goat cheese (chevre) and the coconut oil instead of cream cheese or butter. Some recipes suggested shortening, but I just couldn’t bring myself to put that in frosting. The goat cheese taste is not strong in the frosting — you have to be looking for it. I put it a little extra vanilla to make sure the goat cheese wasn’t strong. And the texture of the frosting replicates cream cheese. All in all, a great combination of flavors. 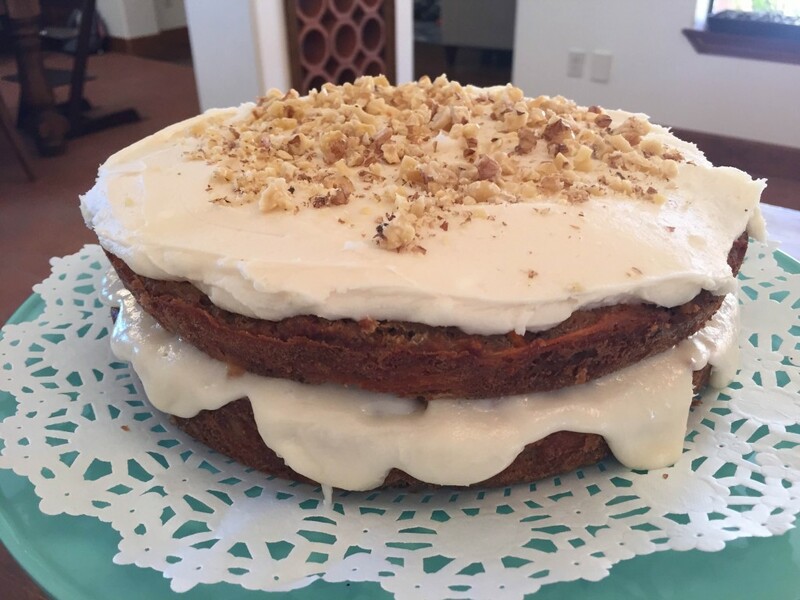 I researched a lot of goat cheese frosting recipes before deciding on this one from Redwood Hill Farm: Recipe: Use Chevre Goat Cheese for Classic Cream Cheese Frosting. 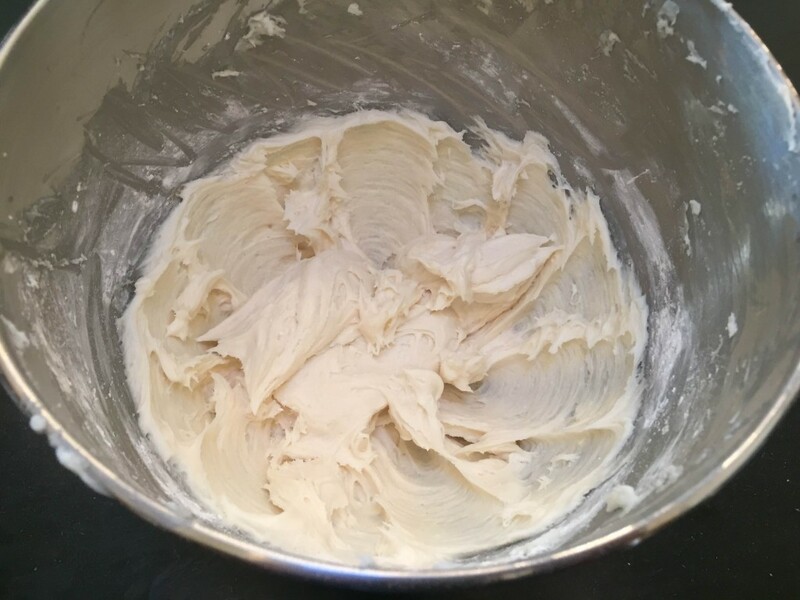 As I mentioned, I used 1/2 cup coconut oil instead of butter, and 1.5 teaspoons vanilla instead of one. I made it in the stand mixer and the texture was fine. 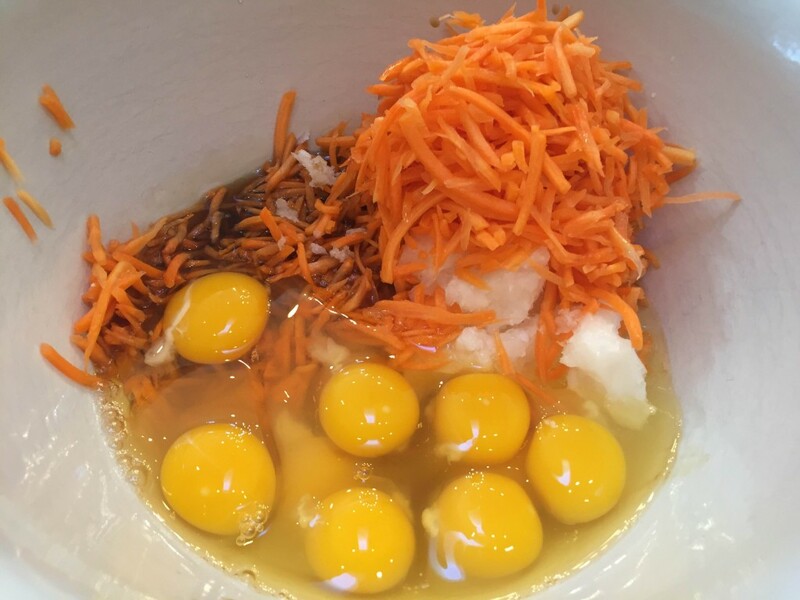 The recipe uses 10 eggs! Wowza! 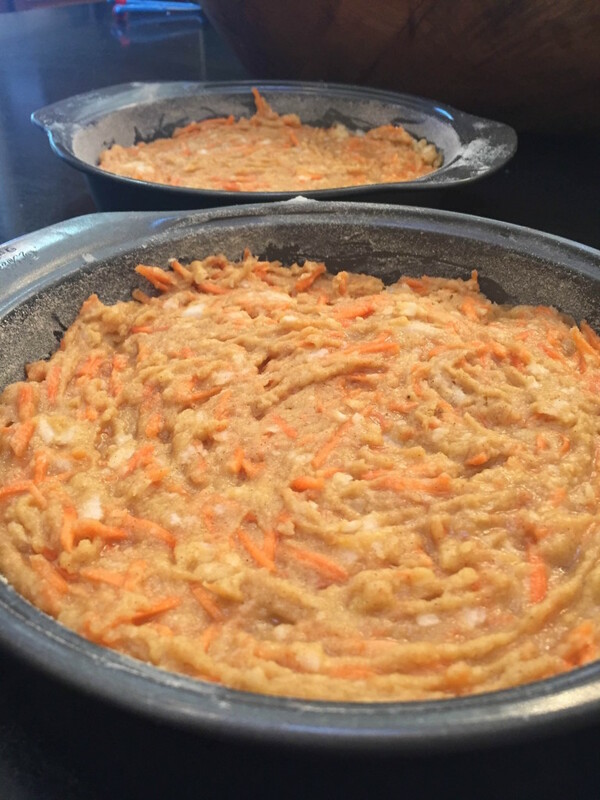 Here’s the batter before it went into the pan. 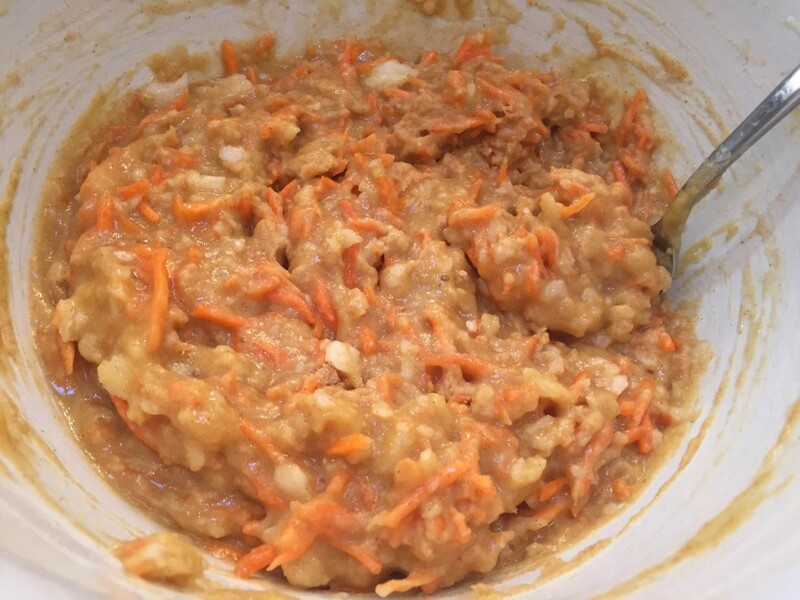 There were still small chunks of coconut oil that didn’t mix in, but that wasn’t a problem. They dissipated during baking. With cut-out circles of parchment paper in the bottom of these pans, and the sides greased with coconut flour and dusted with coconut flour, there was no chance of sticking. 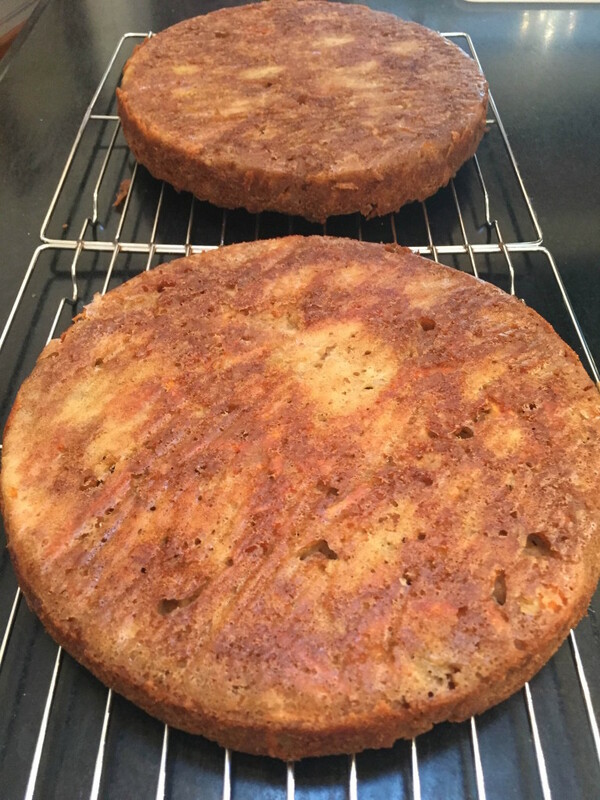 The cakes came out of the pan totally intact, just what you want for a layer cake. These were easy to frost, but I must admit the layers might have been a teeny bit warm when I started, which is why the filling layer is oozing out in cascades. Happy accident rather than intentional aesthetic effect. Luckily it didn’t melt too much. I decided to just do a layer of frosting to stick the cake layers together, and a layer of frosting on top, keeping the sides bare. There would have been enough frosting to cover the whole thing, but sometimes it’s more interesting to see the cake. I also added some walnuts on top. They added a nice crunch to the smooth texture of the frosting.